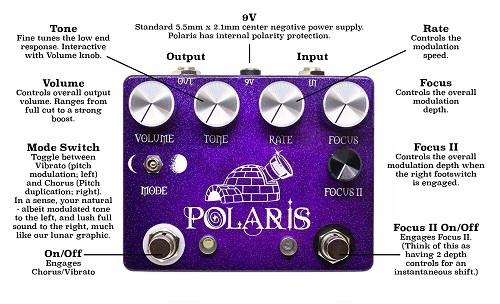 Polaris is a chorus/vibrato inspired by the original EHX Small Clone. A Small Clone chorus pedal has resided in the shoppe since it’s inception. With it’s smooth modulation and simple controls, it was a great starting point. At the heart of Polaris resides an MN3007 BBD chip. The same chip found in the original Small Clone. After recreating the circuit in a breadboard, we moved forward from there. We started by replacing the depth switch in favour of a knob. This allows for better control of the modulation depth. Following in the steps of Daedalus, we incorporated a second depth knob that is selectable via the secondary footswitch. The original Small Clone did not have any tone control options. We decided to implement a Tone knob on Polaris. This knob allows the user to add or cut lower bass presence to the signal. Once we had a tone section sculpted to our liking, we placed a master Volume knob at the end of the circuit. The Volume knob goes from full cut to slightly boosted above unity volume. These two knobs work in conjunction with each other. Lastly, we added a Mode toggle switch to seamlessly alter between chorus and vibrato modes.